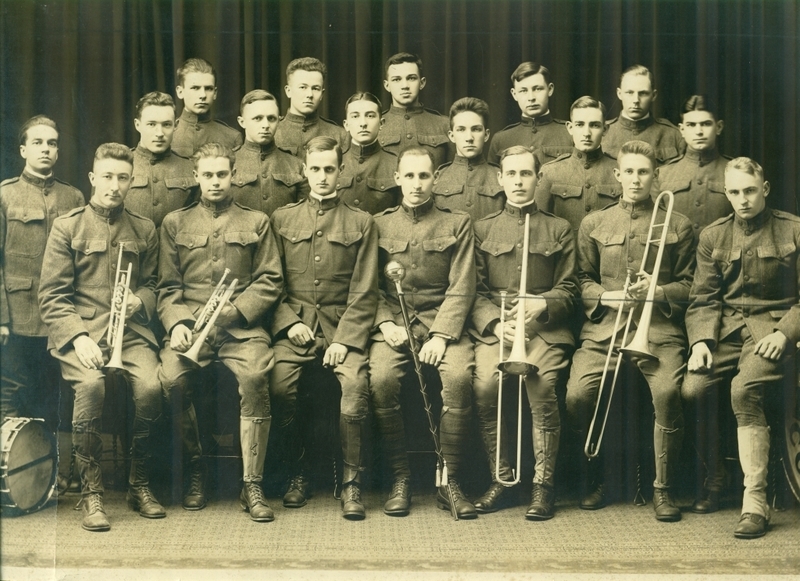 Group portrait of the Bowdoin College Band. Front row, left to right: Bradbury J. Bagley (Bowdoin, 1918), Perley J. Mundie (1920), Howard T. Pierce (1918), Gerald S. Joyce (1918), Clyde E. Stevens (1919), Carll N. Fenderson (1921), Elssworth W. Holbrook (1919). Second row: Edward S.C. Smith (1918), Carroll H. Keene (1921), Tracy S. Wood (1920), Henry Sprince (1920), Philip H. McCrum (1921), Vernon L. Brown (1918), Francis T. Rochon (1921). Third row: George E. Houghton Jr. (1921), Philip G. McLellan (1921), Samuel A. Smith (1920), Ralph T. Ogden (1921), Hillard S. Hart (1921).